Study Bachelor of Exercise and Sport Science, Bachelor of Nutrition and Food Sciences at the University of South Australia (UniSA). Information for International students. Complete placements across a range of industry settings including schools and sporting clubs. Learn in state-of-the-art on-campus facilities, such as our High Performance Sport Centre, Exercise Physiology clinic, Environmental Chamber, Commercial Kitchen and Sensory Laboratory. World top 100 for Exercise and Sport Science4. Build your skills in two highly complementary fields. Learn from experts and world-class researchers, including Australia’s leading exercise scientists and experts in the field. 42019 QS Subject Rankings, Sport-Related Subjects. This double degree is for students who want to combine their passion for health and exercise with nutrition. You will develop a deep understanding of the impact that exercise and physical activity has on the biological, psychological and social parameters of human life when you study our industry-focused exercise and sport science degree. The exercise and sport science component prepares you to provide specialised exercise programming to a variety of individuals, including athletes and the broader community. The nutrition and food science component will allow you to become an expert in all aspects of nutrition and food sciences and be ready to improve the health, fitness and wellbeing of the community. You will learn from world-class industry experts in an environment that provides opportunities for practical learning. You will also practice skills learned in the workplace when you complete industry placements, and will benefit from our strong ties with companies and associations in the field. This double degree will provide you with expertise in the areas of exercise and sport science, and nutrition and food science. You will graduate with a specialised set of skills to meet emerging market needs. Through theoretical and practical learning, you will become an expert in all aspects of exercise and sport science, and graduate with the skills needed to design, implement and evaluate exercise and physical activity programs. You’ll understand diets and lifestyles for optimum health and the associations between nutrient intake, energy output and obesity. You’ll also learn how to manage and improve nutrition and diet related to physical activity and lifestyle changes, and how to maximise physical performance for healthy active people. This qualification enables you to graduate with two degrees in only one extra year. 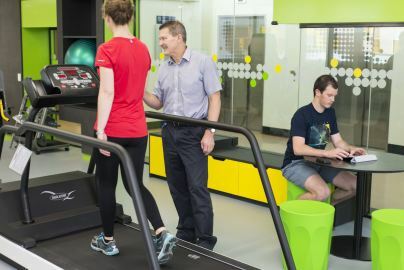 It is also the only double degree of its type in South Australia that provides exercise science accreditation with Exercise and Sport Science Australia (ESSA) as well as registration with the Nutrition Society of Australia1. With a focus on practical learning, and placements provided in the first year, you will be exposed to industry from the very beginning. You will also benefit from our extensive on-campus facilities, which offer a great way to further develop practical skills and explore and experience the hands-on nature of this growing industry. These include our High Performance Sport Centre, Environmental Chamber, Health and Fitness Centre, commercial kitchen, sensory laboratory and microbiology laboratory in our dedicated nutrition and food science hub. You will also have access to industry partners and alliances from a range of elite and local sporting organisations. 1 This degree is accredited by Exercise and Sport Science Australia (ESSA). Graduates are eligible to apply for registration as an Accredited Exercise Scientist through ESSA. National and State Sport Teams: Australian Canoeing, Basketball SA, Cycling Australia, Hockey SA, South Australian Sport Institute (SASI) and Tennis Australia. Football Clubs: Port Adelaide, Adelaide Crows and SANFL clubs. A range of other organisations including aged care facilities, EFM Health Clubs and Team Tempo. 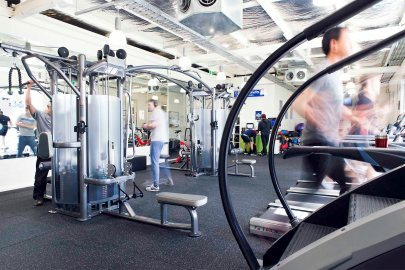 In addition, you will complete various placements, including 80 hours of exercise prescription and delivery, and 60 hours in other sport science related tasks in a variety of settings, including opportunities with national and state sporting teams, football clubs and health and fitness organisations, further enhancing industry networks and relationships. You may also find yourself working in the food industry focusing on product formulation and nutrition, marketing, product improvement or preparation of health claims on functional products. Employment for welfare, recreation and community arts workers in Australia is projected to increase by 4,000 (or 15.9 per cent) by November 20201. Employment for nutrition professionals in Australia is projected to increase by 2,400 (or 37.1 per cent) by November 20201.